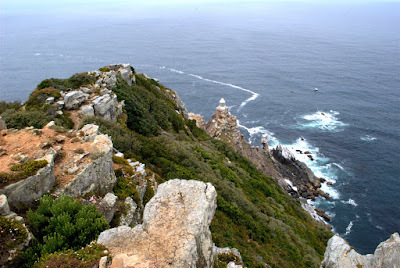 Here's a picture from Cape Point which is right next to the Cape of Good Hope. Both capes are well known, but I don't know why. Old tales used to say that this was the point where the Indian and the Atlantic ocean collided and that there is supposed to be a distinct line in the sea where they met. Although it is where the Indian and Atlantic currents mix sometimes, there's no line. Bummer.